The timing of this last leg of my hike could not have been better. On Sunday evening, I hiked 34+ miles to the center of the city of Lorient, the largest city in the Morbihan department. My feet would have preferred that I spend the rest of the evening in bed, but Sunday night happened to be the last night of the Festival Interceltique de Lorient (which, thanks to Wikipedia, is translated as Gouelioù Etrekeltiek An Oriant in Breton or Inter-Celtic Festival of Lorient in English). The festival lasts for 10 days, always in the first couple weeks of August. It’s the largest Celtic music festival in the world and hosts musical groups from all the Celtic nations of the world. 2021 will mark the festival’s 50th anniversary! I made a last minute decision to switch hotels. I ditched the hotel in the port area in the south of the city, in favor of walking a few extra miles to the Central Hotel, right in the center of the action. I’m very glad I did! Central Hotel is a no frills budget hotel but the manager is extremely friendly and welcoming. And it’s about a 3-yard walk from the entrance to the festivities. Most of the action takes place around Place Jules Ferry, Quai des Indes and Quai de Rohan. Each Celtic nation has its own tent with rotating musical groups. Food (and of course beer and cider) stands are plentiful. On some evenings, there are traditional Breton parties (fest noz) and even fireworks. Though on any evening you’ll see core fans doing traditional dances to the music! Some even in traditional dress…. I was pleasantly surprised at how well organized the event was. For the larger (indoor) concerts, you must buy tickets in advance. But you certainly don’t need to buy tickets to specific events to enjoy the festival. 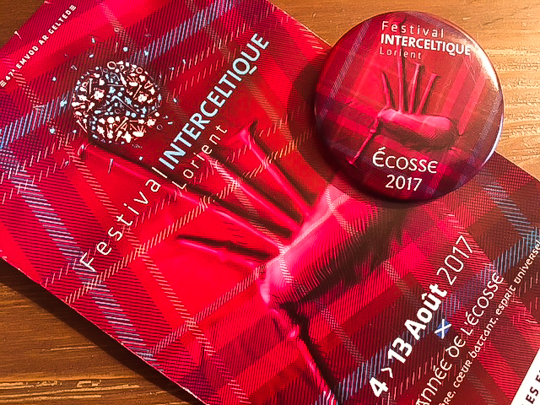 For a mere 5 EUR, you can purchase a “badge” that allows you access to the tents along the quais for the entire duration of the festival. Security was noticeable (bag checks, etc.) but not unwieldy. I hope to catch the festival again in coming years, and if I do, I’ll return to Central Hotel! More on my hike in the next week or two…. The short of it is, Lorient was supposed to be my end-point this time, but I’m still going! Hoping to make it to Auray before I leave Brittany early next week.